Angelique’s attempt to thwart Judah is stalled when he appears in Gerard’s guise and robs her of her powers. She is reminded that he gave them to her in the 1690’s when she was known as Miranda Duval. They take her to Dawson’s, and her peril is clear, but faster than you can hashtag a metoo, she smacks the advocate over the head with a candlestick and escapes. Meanwhile, Barnabas vows to Quentin that he will deal with Gerard and then take care of Tad. Letitia and Desmond marry in his cell, and with Quentin, the new groom goes off the face the headsman with the casual calm of the just. Meanwhile, in Parallel Time, the elderly Justin becomes incensed when it is suggested that Catherine might be joining the family and exposing herself to the curse. 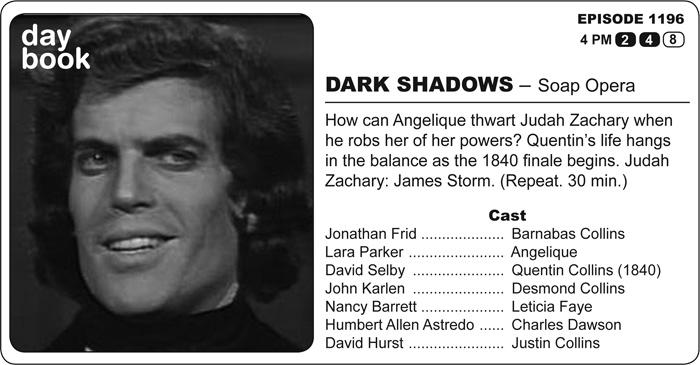 My favorite episodes of DARK SHADOWS are payoff episodes. Rarely has a slow burn paid off in such a spectacular manner. Probably because this has been slowly burning for three years and finally wraps up, pretty much, the series. The key question: is it satisfying? Immensely, and as the first of three episodes, it’s only beginning. All of the potential energy for Angelique to be a force for good is released by just the chance that Barnabas might believe in her. But there are transformations and resolutions all over the episode. Judah Zachary no longer has to wear the mask of Gerard, and James Storm manages the new character with an elegantly brutal menace. He takes her powers as easily as she took Barnabas’ curse. The ease of both actions mocks the years of struggles endured to cure one and mitigate another. Yep. It really was just that simple. For someone in power, anyway. Words for the character -- almost -- to go out on. Anyone doubting who Barnabas is (prior to Angelique’s death) need only hear that one sentence. Not the monster who kidnapped Maggie. Not the indecisive worrywart who semi-bungled through Adam and the Leviathans. No. This man. The clay is out of the kiln, and there should be no doubt that this IS Barnabas Collins. Everything else was just a rough draft. Finally, I love the strange, macho-buddy pallsiness of Quentin and Desmond as they Bo and Luke their way to the headsman’s block. It’s taken nearly five years, but DARK SHADOWS finally has a masculine moment with more than two butch actors on screen at the same time. If they’d only had Mitch Ryan, it would have looked like a Rat Pack movie. They are ending an era. My, how a little show about a lost girl from New York has changed.